A watch house was erected on Lambeth High Street in 1825, for the purpose of holding ‘the drunk and disorderly’. Its site is marked with a stone in Lambeth High Street Recreational Ground. The building was apparently demolished at some point between the wars. 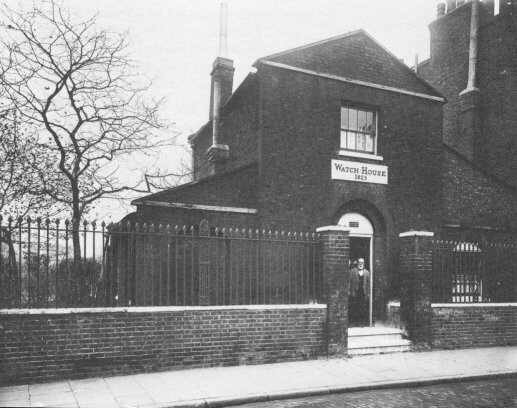 There was a second Lambeth Watch House next to St John’s Church in Waterloo Road. This existed until 1930. Not all the watchhouses were as solid as that shown in the picture – some were of wood, and there is an account of one watchman, watchhouse and all, being heaved over the wall into Bunhill Fields cemetery by a band of ruffians. The general ineffectiveness of the parish watchmen led to their supersession by the Metropolitan Police under the Police Act of 1829.